On Monday, Feb. 11, West Junior High was visited by Mary Ricker, the newly appointed commissioner of education. Commissioner Ricker held two sets of listening sessions during her 90-minute visit, one for staff and parents and another for students. These listening sessions will inform her priorities for education, including her top priority of ensuring that every student receives the highest quality education possible. West Junior High students were strong advocates for their school. They spoke about the value of being educated in a diverse setting, their strong relationships with their teachers, and their overall sense of belonging at West Junior High. 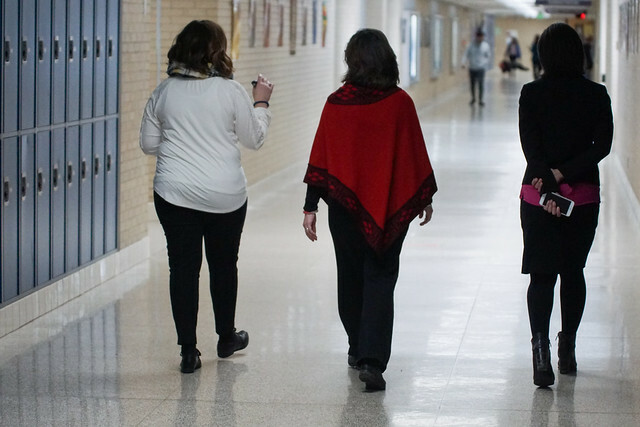 After the student listening session, Commissioner Ricker received a tour of the school from Dr. Leanne Kampfe, Principal of West Junior High, and Dr. Rhoda Mhiripiri-Reed, Superintendent of Hopkins Public Schools. The tour included three stops to classrooms to observe learning.